The Clone Sergeant Phase 1 in Star Wars: Galaxy of Heroes is likely one of the original characters in the game. We drew him as one of my original team when we first joined the game back in February, but due to his rather simplistic kit and acceptable but not spectacular damage, we pretty much ignored him; At least until Echo came out and we took a hard look at what a four clone team would do synergy wise. But theory-craft is notoriously unreliable, we prefer real tests and so scrambled to get Sergeant arena viable in Star Wars: Galaxy of Heroes. The really great news is that Clone Sergeant in Star Wars: Galaxy of Heroes can get to his gear maximum of 10 with only two fusion furnaces. (three if you want to get pedantic about his level 10 gear slot which will not open up gear eleven). My sergeant is gear maxed, lacking only a final fusion furnace which will not advance him to the next gear level if fitted. He is at his level 7 abilities on everything save his basic which is fitted with an omega which grants 50% turn meter on a critical hit. We are strongly considering fitting an omega on his unique ability which would give him a 100% chance to get offense up on a critical hit instead of the 50% chance he has at his level 7 ability. The Clone Seargent Phase 1 in Star Wars: Galaxy of Heroes is an AOE character who grows stronger the more clones allies he has. Before we get into performance, please note that all the videos and screen shots from this point down are duplicates of Echo’s review, so if you have seen those media, you probably don’t need to view them again. Clone Sergeant is an average attacker on par with Hoth Rebel Scout, Luke, Resistance Pilot, and Resistance Trooper. On the whole you can expect him to deal around 50% of the damage Rey will dish out and this is borne out in the raid video and damage screenshot below. The problem is, to get those numbers he pretty much needs Omegas on his first and unique abilities for his turn meter and offense up. He also needs to be paired with Leia for crit chance up and/or in a full clone synergy squad. Unless you are planning on a clone synergy squad there are better attacker class characters you can use. BUT, in a synergy squad Clone Sergeant does a very respectable job of doing his part. Again, an omega on his unique to ensure offense up on a critical hit would be a fairly huge boost to his damage. We did not attempt to use his AOE for turn meter reduction on the boss because while he will always attempt to apply it, his potency is too low to be of any real use since it will be resisted so much even in a sub-heroic raid such as this. In the arena Sergeant’s recommendation is pretty much the same as in raids. Omega his basic and unique, play him in a clone synergy squad or not at all. As you can see in the videos, replacing Rey with Sergeant, even with Fives and Rex providing synergy, we still fared worse (loss) in the auto battle test. It was only when Echo was added giving a maximum four clone synergy that we regained a winning team. Arena 2 — Five Battles. Control/Echo/Sargent/Echo+Sargent/Echo+Sargent — All wins. In a synergy squad, Sergeant is an arena meta class character, though some hybrid squads will still beat out (marginally) a full clone squad on defense. Without that clone synergy, Sergeant is not even close to being arena meta. In the final cantina node battle, again in a full synergy squad, Sergeant did respectable damage that we would judge to be on par with all other non-elite (Rey/Leia) attackers, and slightly better due to the synergy. The Clone Sergeant Phase 1 in Star Wars: Galaxy of Heroes is a slightly sub-par attacker that becomes slightly better than par when in a full synergy squad. Needing only two Fusion Furnaces to get to his final gear level, he is relatively easy to level and provides a big bang for the equipment buck — again if you are running a full synergy squad. With a full clone team he is useful in raids, missions, and is arena meta. 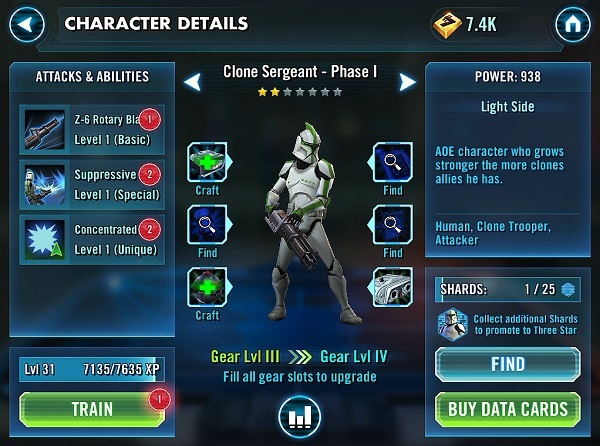 Without a full clone team in Star Wars: Galaxy of Heroes the Clone Seargent is sub par compared to other attacker class characters. If you have Rex and Echo (pay to win only), you will want to level this character as the synergy benefits of a clone team are substantial and Clone Sergeant both benefits from this synergy and contributes to it in the form of increased damage. If you do not have Rex and Echo there are better options available to you, one of them being Resistance Trooper who can reach Gear Eleven (one armor level higher) for only two fusion furnaces, or Luke Skywalker (same). Thanks to user The Consulars for creating this review for the Clone Seargeant. Find more Reviews and Guides to Star Wars: Galaxy of Heroes in our Guide Section. What do you think of Clone Seargeant in Star Wars: Galaxy of Heroes? Is he good or bad? Do you have any suggestions or feedback? Please feel free to leave a comment below. Be the first to comment on "Clone Seargeant Phase 1 Review – Star Wars: Galaxy of Heroes"